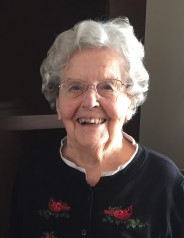 Wanda Espeset, 102, of Rochester, MN, formerly of Rushmore, MN, died Sunday January 27, 2019 at St Marys Hospital in Rochester with complications from pneumonia. Wanda was born June 26, 1916 in Holloway, MN to William and Sada (Pierce) Krohn. On June 11, 1939 she married Allan Espeset in Fulda, MN. Allan died in June of 1995. They raised three sons while living in Rushmore, Brian (Leona Lewis) of Mankato, MN; Paul (Pat Lester) of Rochester, MN; and Robert (Linda Graff) of Roseville, MN. Her eight grandchildren are Michael, Richard, Laura, Kevin, Erika, Andrew, William, and Anne. Her eighteen great-grandchildren are Jackson, Claire, Nathan, Ethan, McKelvey, Finley, Maren, Luke, Jacob, Zachary, Nicholas, Elise, Scarlet, Valencia, Allison, Cora, Isla, and Lyon. Her one great-great-grandchild is Kale. Wanda was preceded in death by her parents, and her five siblings, Audra O’Clair, Verne Krohn, Robert Krohn, Bill Krohn, and Duane Krohn. Teaching and youth development were a big part of Wanda’s life. She was an elementary teacher in country schools in Nobles County, then in Reading, and Rushmore. She earned her normal training teaching certificate in 1935. In 1971 she commuted to Mankato to earn her Bachelor of Science degree in education from Mankato State College. In addition to teaching, Wanda was a 4-H leader for 20 years. Wanda enjoyed music. She played the organ in her apartment up to the last week of her life. She played at her 100th birthday celebration. She would always entertain her visitors with a few of her favorite songs. Wanda loved being with her family and friends. Her happy personality, infectious smile, and positive attitude made people enjoy being with her. While there were tough times such as growing up in the Great Depression and the loss of her husband, her resilient spirit carried her through. Her funeral will be held at 11:00 a.m. on Friday, February 1st at the Congregational Church, United Church of Christ in Rochester with Rev. Garth Schumacher officiating. Visitation will be held at 10:00 a.m. There will also be a visitation from 10:00 a.m. to noon on Saturday, February 2nd at the Dingmann Funeral Home in Worthington. She will be buried at the Garden of Memories Cemetery beside Allan, her husband of 56 years, on Saturday after the visitation. In lieu of flowers, memorials are suggested for the music program at the Congregational Church.